Turkish President Recep Tayyip Erdoğan criticizes the ban on Nicolas Maduro on the occasion of Caracas’s visit. While Host Nicolas Maduro has exposed the right to export Venezuela’s gold. 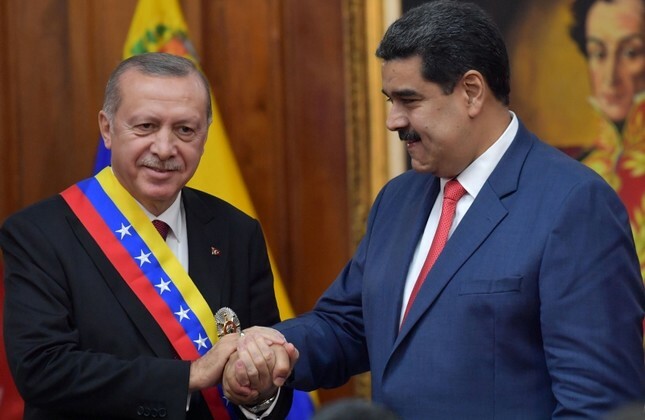 The Turkish President said while speaking in a forum with President Nicolas Maduro in Venezuela’s capital that political problems can not be solved by punishing a whole nation. We do not support steps in which global trade principles have been ignored. Recep Tayyip Erdogan has declared his counterpart Nicolas Maduro as a modern Simon Bolivar, who says he will defeat all the attacks against him. Later, Nicolas Maduro condemned the US sanctioned sanctions on its own country in the joint news conference with the Turkish President. And said that imposing illegal sanctions on Venezuela it is preventing the world from selling gold while it has the right to sell gold. The US had banned sanctions on Venezuela authorities and its gold last month. He accused Venezuela officials of being involved in corruption. He banned financial transactions with the Nicolas Maduro government and accused of human rights violations. US President Donald Trump signed an administrative order last month under which any person belonging to the United States had banned transactions from Venezuela as a result of fraudulent fraud and corruption and individuals involved in the sale. Venezuela has suffered economic crisis for the last 5 years and has lost the food and medicine in the country. President Nicolas Maduro states that America’s economic warfare is responsible for its country’s problems but critics say their socialist policies introduced by President Hugo Chavez have resulted in the country’s economic crisis. And this is proof that these policies have failed. The Turkish President has not directly referred to the US or President Trump. However, he said his friend Nicolas Maduro is facing some exploitation, economic killings and demolition operations from some countries. To cope with this, he said he was ready to strengthen trade ties with Venezuela. The Turkish President has accused the names of some countries and constituencies without involvement in the conspiracy of assassination of President Nicolas Maduro in August. One of the reasons for this attack is Venezuela’s support for Palestinians. It is clear that bilateral trade between Turkey and Venezuela is increasing gradually. Turkey has purchased the golden gold from this country in continental South America this year. According to Turkey-based data, during the first 9 months of the year, I have imported gold worth $ 90 million worth of Venezuela.